Note: The following essay will be published in the proceedings for the 2014 ACSA annual conference. I want to thank ACSA for giving me permission to repost it here on my blog. The horizon that lies before us is one that science cannot approach alone. It is the horizon that represents the ethical, moral and spiritual dimension of the power we possess. We must not shrink from exploring that far frontier of science. But as we consider how to use this new discovery, we must also not retreat from our oldest and most cherished human values. We must ensure that new genome science and its benefits will be directed toward making life better for all citizens of the world, never just for a privileged few. With all of the research that has been conducted since the start of the new millennium, the most surprising aspect of recent developments has not been how far we’ve come but the ground that remains fallow. In contrast to the enthusiasm we have put toward creating a wide array of dizzying and novel architectural forms, much more work remains to be done in theorizing the cultural projects that are implicit in Architectural Biology. One default orientation has been to interpret formal diversity as an end in itself, perhaps as a form of mass customization that is little more than the individuation of mass production. This position assumes that digital architectures visualize the social and political realities of new networking tools and the cultural elite that has reaped the most benefits in today’s globalized society. 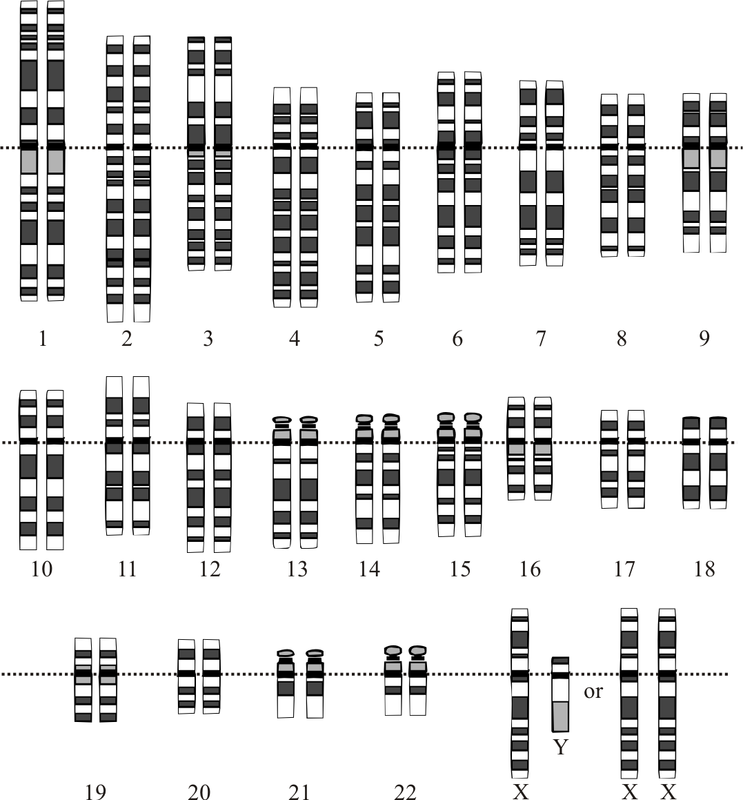 However, such readings do not consider the cultural implications that were implicit in the new model of nature that was inaugurated with the Human Genome Project. Such implications were nowhere more self-evident than in the debates that emerged after the full mapping of the human genome was completed. In 2006, after nearly two decades of processing massive amounts of data, the number of genes contained within the body numbered nowhere near the 100,000 scientists had expected. The final number currently lays somewhere between 20,000 and 25,000; much less than the numbers in seemingly simpler organic specimens. The key to human biology was not rooted in the sheer number of genetic material, but in the manner in which the human body actualized physiological variations. In contrast to neo-Darwinian models of evolution that considered the transmission of information between genes and their surrounding proteins to be unidirectional (essentially from the DNA strain outward), scientists discovered the presence of multidirectional exchanges occurring within an epigenetic layer lying just above the human genome. This extra-genomic mechanism for processing information within the body led to a new frontier of research that explores the contingency of DNA coding in real-time circumstances. According to new research, external factors lying outside of the human genome have as much influence on the mature expression of genes as the interactions occurring within raw DNA coding. Cultural factors such as diet and stress exert tremendous influence upon the body at crucial points in its physiological development, giving the social and political causes of deprivation new biological importance. The epigenetic layer not only retains the memory of environmentally caused changes in one generation, but it seems to pass this information on to subsequent offspring, thus achieving a form of cultural memory that shares the gains and losses of each generation. A flexible structure of conglomerated proteins situated outside of the human genome regulates the genetic expression of DNA by physically coiling tightly to prevent interactions with surrounding proteins, or uncoiling to permit a greater number of interactions. The implications of these findings are profound if they make us to rethink the relationship between form (as generated by ‘code’) and culture (as reflected by forces external to ‘code’) at the cellular level. While architects have more easily transformed information with discreet data points such as heat loss and thermal behavior, cultural factors elude such reductive modeling. Such new information should make us question where we have too hastily based our geometrical translation of biological complexity on coding, which tends to limit the contribution of cultural forces in the digital design process. In architecture, a sole emphasis on ‘complexity’ runs the danger of repeating the unidirectional assumptions of neo-Darwinian biology (i.e. as a top to bottom process of decision making) by reducing the information contained within design processes to data that can be quantified as scripts or codes. What we need instead is a nuanced model of Architectural Biology that considers it to be a multidirectional processes of exchange that balance the production of meaning and form. What we need is a way to visually express the complexities that occur within the epigenetic layers of exchange within the human body. The social consequence of a neo-functionalist or autonomous conception of Architectural Biology is the perpetuation of inequality through aesthetic distinctions that legitimize the social stratifications established by biological essentialisms of the past. This condition is ironic because the very novelty of genomic research is the non-essentialist model of scientific materialism it offers the public imaginary. The fact that form and meaning are the products of a complex series of feedback loops between biology and history should offer contemporary architects new ways of reforming old habits. The ironic return of essentialism is especially dangerous in contexts where the sheer economics of building economies of scale continues to be stratified within older ‘First World’ and ‘Third World’ categorizations of the nineteenth and twentieth centuries. The public’s reception of architecture is also inherently complicated by the cultural and intellectual contexts that condition architectural production and the history of science. One can point to the racial ideologies and identity politics that are a lingering part of historical memory, which require designers to consider the potential essentialist readings of their work. Architects must remain cognizant of the fact that borrowing the disciplinary tools and conceptual models of biology comes with a certain amount of baggage that must be explicitly managed. Though we can work with other disciplines to clarify this relationship, the architect remains responsible for turning the ephemeral values and expectations of ‘Architectural Biology’ into physical and material spaces. In lieu of merely translating the visual complexities of biological metaphors into self-representational models of architectural construction, we have a unique opportunity to intentionally use the complex geometries of the present to critique and reconfigure the historical meanings of the past. In this sense, the destabilization of meaning that is seemingly inherent in the homogenous and shiny surfaces of digital platforms offer complex new meanings when juxtaposed directly against older essentialist interpretations of historical forms. Such an approach does not try to determine the ultimate representational meanings of digital forms sui generis, but uses a purposeful negotiation with past forms to contribute to a dialectical resolution of the present. This cultural project has only been afforded us as new models of nature (via genomic research) make it possible to problematize essentialist conceptions of materialism with architectural materials. If this critical project is to gain ground in the present, it must build upon the cultural critiques of personhood and identity that have already exposed the political functions of biological essentialism in Western architectural traditions. 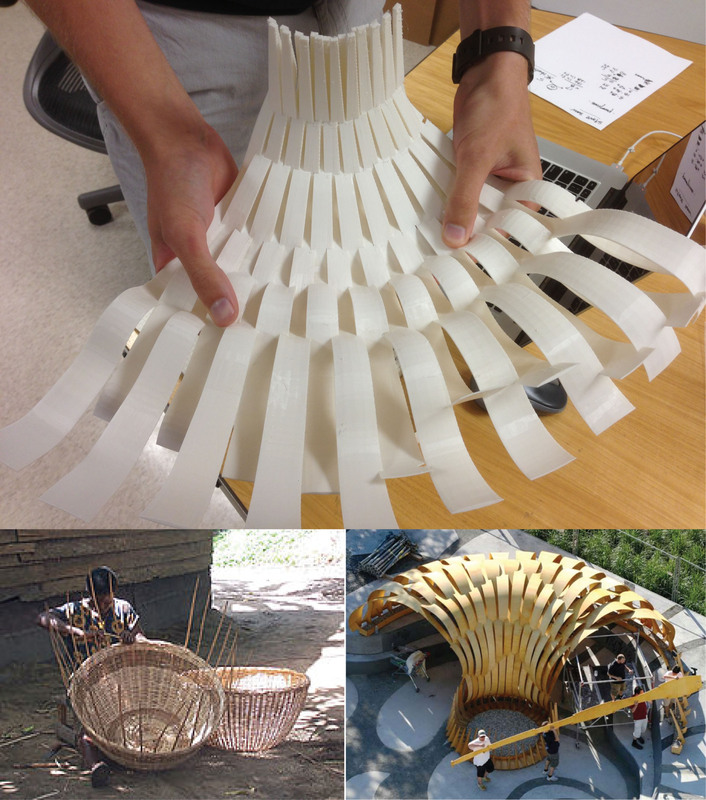 I took on the challenge of outlining such an explicit cultural project in a recent exhibit on parametric design organized at UNC Charlotte in the fall of 2013. 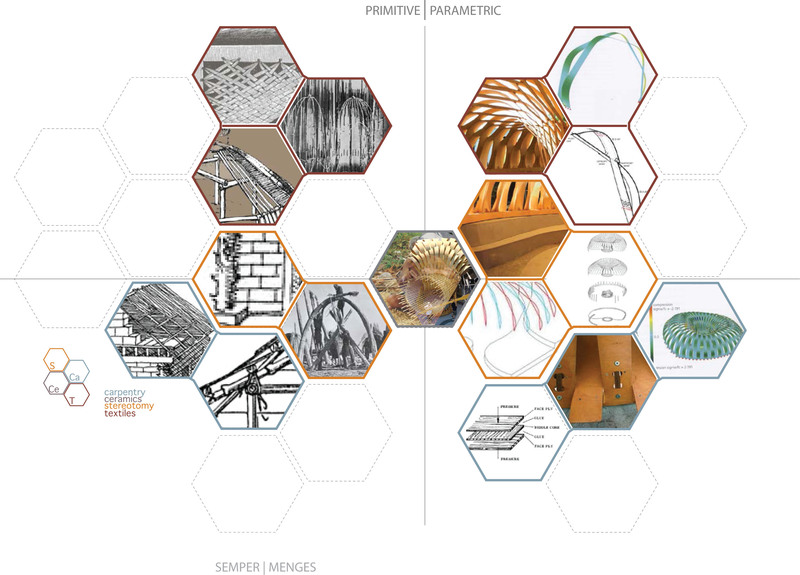 This exhibit, entitled “Primitive Parametrics: Biology as an Architectural Catalyst,” was completed with the help of Chris Beorkrem and Brian Shields, two design faculty at the school and a number of student assistants. While the overall purpose of our exhibit was to visualize the long history of Architectural Biology in modern architecture, my primary focus slowly became the staging of an exhibition space that encouraged visitors to discursively rewrite the essentialist assumptions Western modernity. In this sense, the main goal of my participation in this exhibit was to find a way to explicitly visualize the architectural critique of biological essentialism in order to articulate the cultural stakes implicit in new biological metaphors for design. In contrast to previous historiographies of modern architecture that have concentrated on the formal principles of biological metaphors for design, we attempted to recover the cultural meanings and associations of historical architectures. These lessons were examined in architectural theory proper, as well as work completed by scientists and cultural theorists that isolated the cultural stakes of scientific imagery for visitors to the exhibition. In this way, the exhibition synthesized periodic social critiques of cultural essentialism with the projective paradigms of contemporary, thus widening our gaze beyond the search for formal complexity in architecture. 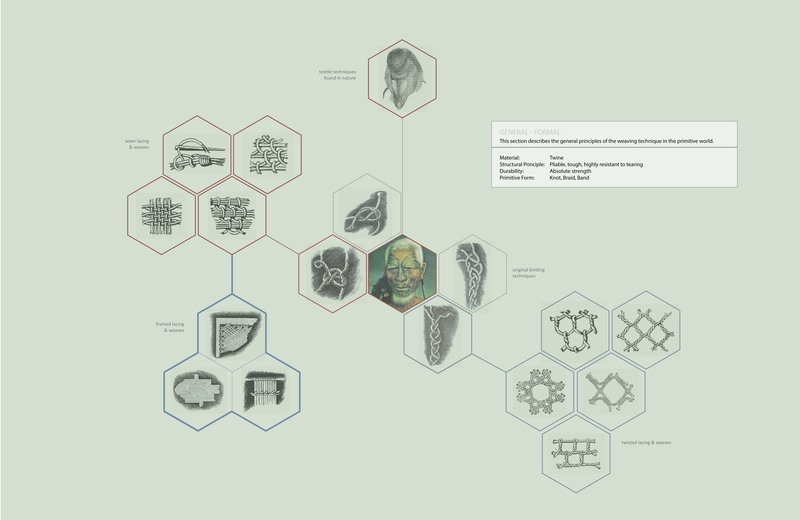 For the exhibit, we created a series of analytical diagrams and three-dimensional models that first juxtaposed, and then synthesized the essentialist and non-essentialist content of the biological metaphor architectural history. The initial meaning and import of Architectural Biology through the ages was revealed through an extended historical timeline that spanned from the second half of the nineteenth century to the present. In contrast to previous historiographies that concentrated on the architect’s exclusive formal or functionalist interpretations of biological principles, this show recovered the cultural import of nineteenth-century organicisms and looked for strategic opportunities to relate the formal and cultural prerogatives of historical modern architectures with contemporary techniques. In this sense, the ‘long history’ of Architectural Biology established a conceptual field within which a visitor could strategically reconfigure the ethos of contemporary practice. As I stated above, my particular interests were in critiquing and reconfiguring the essentialist assumptions of biological metaphors in nineteenth and twentieth century architectures. The first series of maps we constructed were of historical examples, and these served as ‘parent’ diagrams for the mapping and overlay of contemporary techniques studied in the show. The most comprehensive diagrams visualized the German architect Gottfried Semper’s typological explanation of the architectural components of the Primitive (Caraib) hut, which broke down into what he termed the “four elements of architecture.” During the nineteenth century, Semper interpreted architectural styles as a final stopping point in the evolution of the practical arts that began with the innate drive of primitive race groups to create artistic forms. According to the timeline outlined in his architectural treatise Der Stil, monumental architecture only became a distinct realm of art when it advanced far enough in human civilization that an immediate understanding of past practices (not forms) was completely lost. Reviving the continuous historical evolution of the basic idea of art (i.e. the treatment of materials) constituted the basis of Semper’s organic interpretation of the past. Using this evolutionary model of historical development, he explained the temporal progression from early textile or weaving practices to the ornamental treatment of tiles and brickwork. This historicist model of cultural progress anticipated the developmental principles of biological thinking in the twentieth century, although it integrated biological and cultural developments in one comprehensive system. Our maps of Semper’s four elements (enclosure, hearth, roof, and mound) visualized the cultural history explained in his text, which was visually depicted as phylum-like organizational structures in the show. These tree diagrams mapped the cultural parent/child relationships that were propagated across time. [Fig. 1] According to Semper, the primordial method for finishing textiles began with tattooing in primitive tribes that mimetically imitated the logic of simple knots, binding, lacing and weaving. These primitive techniques for binding twine migrated to the practical arts in the form of tool binding techniques, the weaving of mats and headdresses, and so on until the appearance of textiles and banding ornament gave birth to representational forms. Each cultural component in this string of development was considered an evolutionary adaptation of a previous technology, which preserved its essential primitive logic in each successive generation. In the context of our exhibit, Semper’s evolutionary history of style established a conceptual datum of essentialist interpretations of material culture against which we compared the formal and cultural implications of contemporary biological metaphors in contemporary case studies. Semper’s theory was essentialist insofar as it took primitive artifacts to be physical proxies and representations of racial and national genius. In this sense, the Tirolean truss of German history had preserved national history as much as the racial type forms of biology and ethnography. 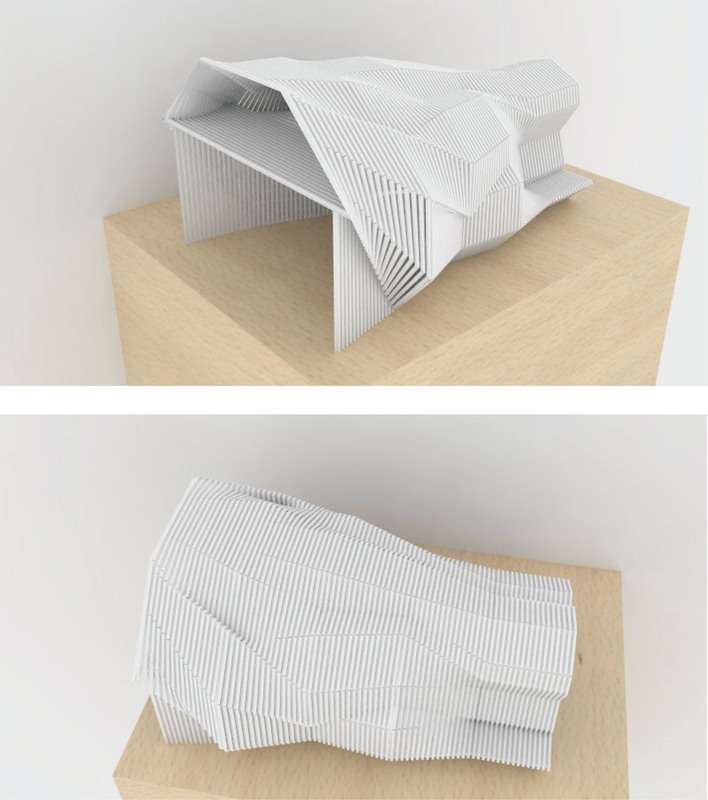 In order to revise the structural logic of Semper’s biological assumptions, we chose contemporary architects who specifically referenced Semper’s theory of tectonics and used the contemporary findings of genomics to create their architectural forms. These architects included Lars Spuybroek, whose ‘textile tectonics’ is a purposeful inversion of Semper’s tectonic system, and the research group led by Achim Menges in London, whose writings make direct reference to Semper and contemporary biology. We tended toward selecting contemporary pavilion and demonstration projects that emulated the scale of the primitive huts Semper used to model his original theory of the four elements. Whenever possible, we chose forms with similar tectonic structural systems to permit the juxtaposition and overlay of historical century case studies to reveal both explicit and implicit conceptual relationships between the critical functions of biological metaphors in architectural discourse. Despite the depth and complexity of these maps, they do not fully demonstrate the compelling formal relationships that we began to recognize between each of the designer’s we were considering. As these products were primarily analytical, we needed a way to explore the visual principles these characters brought out of the images and forms of each set of projects. This visual and formal goal resulted in a series of two and three-dimensional collages in a wide variety of media, which were intended to create a more sinuous linkage between each of the projects we considered. The products of this portion of the investigation included collages between hand drawn works, photographs and three-dimensional computer models. They included laser cut and 3-D printed components as well as hand sketches. We included a small series of collages which best described the correlations we recognized across generations, and exhibited them near large 3-D prints which were intended to meld the 3-D forms of each project together into one synthetic object. Our hope is that this procedure will literally draw attention to the limited cultural connection contemporary methods create by infusing contemporary projects with Semperian cultural references. These analytical models and drawings demonstrate the overlays illustrated in each of the maps created by drawing physical connections between materiality, formal expression and methodology. These collages are the material means we have used to critique the limited cultural work that is currently being performed in architecture today. The abstract character of each 3-D model allows the viewer to relate the formal and cultural referents included in each collage, which conflates the ‘primitive’ and ‘parametric’ qualities of each historical case study into one synthetic image. For example, one of the collages that we chose to use in the exhibit combines the formal and cultural attributes of three separate projects: NOX’s Sun-O-House of 2006 and the Tirolean truss system illustrated in Gottfried Semper’s Der Stil (1860-63). [Fig. 3] The sectional character of this model conceptually transforms the fundamental aspects of the Semper’s Tirolean truss system into the complex geometries of NOX’s Sun-O-House. The individual trusses of each case study are juxtaposed with one another, projecting creating the flowing geometries present in NOX’s water pavilion from the typological systems outlined in Der Stil. The new synthetic form that is created proposes a semiotic integration (and implicit revision) of the primitive hut of the past with the parametric pavilions of the present. The same is true for the ICD pavilion designed by Achim Menges in 2010. [Fig. 4] Our juxtapositions of the weaving techniques described in Semper’s thesis and used to construct the physical pavilion in Stuttgart establish a confusion between the ‘primitive’ and ‘parametric’ referents in the show. The fact that the final product can be held in one’s hands, returning the full-scale abstraction of Menges’ original construction back to the primitive contexts of Semper’s architectural treatise only reinforces this confusion. Yet, the result is not negative insofar as it makes the viewer of the show consciously realize the structural and technical relationships that exist between two competing models of biology in architecture. The final product of the show is not a style or aesthetic, but an ethos for recovering the cultural significance of the biological metaphor in architecture. This methodology inaugurates a critical approach to identifying and, through juxtaposition and overlay, revising the explicit meaning of Architectural Biology. In the models presented in the final show, Semper is visually presented as dealing with the same issues of cultural evolution and representation that NOX and Menges deal with today. However, the scientific and cultural assumptions under which each architect makes their interventions is different. Only through comparison can one make these differences explicit to the public. Perhaps, such a cultural program can even help to retrain the public’s general conception of genomics and human identity. 1. Manuel Delanda. “Deleuze and the Use of the Genetic Algorithm in Architecture,” Center for Media, Teaching and Learning, Columbia University, April 9, 2009. 2. Greg Lynn. “Blob Tectonics, or Why Tectonics is Square and Topology is Groovy,” in ANY… This is italicized style. 3. Detlef Mertins. “Bioconstructivisms,” in NOX: Machining Architecture, edited by Lars Spuybroek (Thames & Hudson, 2004), 360-369. 4. Martin Bressani, “Observations on Architectural Biology: the Gen(H)ome Project,” Log, vol.9 (Winter/Spring 2007), 119-127. 5. “The Ghost in Our Genes,” Directed by Alan Ritsko. 2006. A NOVA Production by Holt Productions LLC and the BBC. 6. Nicholas Wade, “Scientists Complete Rough Draft of the Human Genome,” New York Times June 26, 2000. 7. See Antoine Picone’s special issue of Architectural Design (AD), entitled “Ornament: the Politics of Architecture and Subjectivity,” Architectural Design (Wiley, 2013); and Ali Rahim and Hina Jamelle special issue of Architectural Design (AD), entitled “Elegance,” (Academy Press, 2007). 8. Reinhold Martin, “Organic/Organicism,” in Index Architecture: a Columbia Architecture Book (MIT Press, 2003), 148.